Since its introduction prior to the 1994 World Cup, the adidas Predator series has revolutionized the soccer cleat industry with a design dedicated to giving players greater power and more ball control. 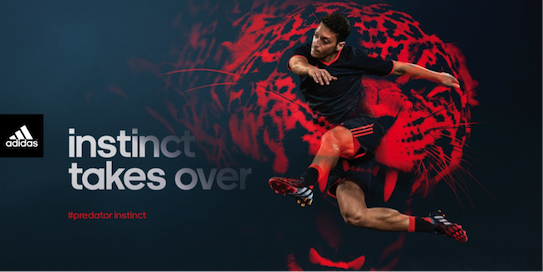 Now, twenty years later, the adidas Predator Instinct carries on the tradition of pioneering technology and elevating the game of football. By altering the five lethal rubber zones of predator® technology (larger in size, variation in the location), the Predator Instinct brings more bend ability and ball control. The updated control frame and transparent, firm ground outsole boosts player speed to the next level. And the warrior stripe inspired design tells the competition that this player is battle-ready and a competitive edge. Customize your boots and take your Predator to the next level. Choose from different outsoles to specialize your boots to pitch conditions, and add touches of glow-in-the-dark and reflective details to make sure your opponent can watch as you steal the ball. 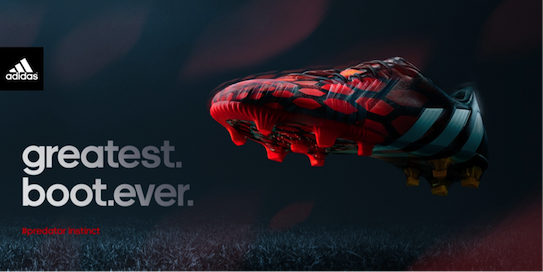 The adidas Predator Instinct, battle ready and customizable, is available on adidas.com. Sports Techie, Free shipping for cleat, gear and product orders over $49, plus free returns, are nice upsells to consider for yourself or as a gift. You can also sign up for the adidas newsletter and receive 15 percent of a purchase, some restrictions do apply. I love the miCoach line. These game changing cleats have been around and upgraded for 20 years. There are now 9 products to select from. You can customize it and make the mi Predator Instinct Custom Cleats exactly as you want them, just like 2014 FIFA World Cup Golden Ball winner, Messi. Of course, the German National team and World Cup Brazil Champions, wear an adidas kit, as well as apparel, shoes and more. After all, adidas was founded in Germany by Adolf “Adi” Dassler on August 18, 1949. If you want to practice with the best soccer ball ever, the Official FIFA World Cup match ball is available as a nice complement, read about the Brazuca soccer ball via these Sports Techie blogs. Get #allin right here: adidas Predator Instinct.